It is the year 1250 B.C. during the late Bronze age. Two emerging nations begin to clash after Paris, the Trojan prince, convinces Helen, Queen of Sparta, to leave her husband Menelaus, and sail with him back to Troy. After Menelaus finds out that his wife was taken by the Trojans, he asks his brother Agamemnom to help him get her back. Agamemnon sees this as an opportunity for power. So they set off with 1,000 ships holding 50,000 Greeks to Troy. With the help of Achilles, the Greeks are able to fight the never before defeated Trojans. But they come to a stop by Hector, Prince of Troy. 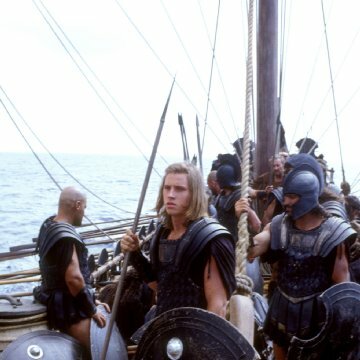 The whole movie shows their battle struggles, and the foreshadowing of fate in this remake by Wolfgang Petersen of Homer's "The Iliad." James Horner composed the score for the movie in less than a month and a half, whereas Gabriel Yared spent over a year on his version. 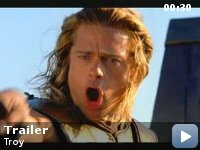 In the 2007 Director's Cut Edition, Wolfgang Petersen used some parts of Yared's score and music from other films, especially from Planet of the Apes, The Count of Monte Cristo and Starship Troopers in the fight scene between Achilles and Hector. Continuity: When Hector and Achilles have their final showdown, Hector is seen with some sort of string or hair strand extending from just below his helmet on his left. When the scene goes to show him removing his helmet, this item is gone. Odysseus: [voiceover] Men are haunted by the vastness of eternity. And so we ask ourselves: will our actions echo across the centuries? Will strangers hear our names long after we are gone, and wonder who we were, how bravely we fought, how fiercely we loved? I finally got to see this movie in the bargain theaters here in El Paso on Labor Day. I originally hadn't thought much about the movie, but as time went on it had left the regular theaters here in town and I realized that I'd wished I'd gone to see it. I remember hearing several outside critics blasting the movie as horrible and wanted to judge for myself. I'm very glad I finally saw this movie. This movie is not the usual Clash of the Titans/Jason and the Argonauts type of movie where the gods are constantly shown and portrayed as more important and powerful than the lowly humans. In fact, this movie completely ignores the so-called gods and instead places the focus where it belongs -- on the warriors themselves. I have studied the Iliad as well as other stories surrounding the mythical Trojan War since my days as an elementary school geek obsessed with mythology and Dungeons & Dragons. Instead of being targeted toward that audience this film demystifies the Trojan War and treats it in a manner in which it could have actually happened. We see that the elders who continually refer to their so-called gods come across as fools. 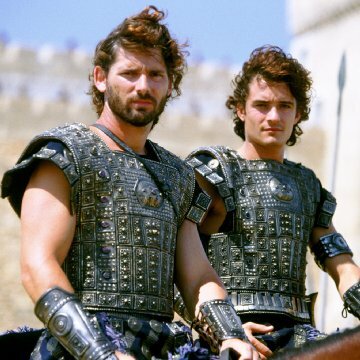 One of the most telling lines is when Hector (Eric Bana) refers to the fact that Apollo did not strike down Achilles (Brad Pitt) for desecrating the statue. It is very telling that Hector seems to doubt the gods he has been taught to worship. 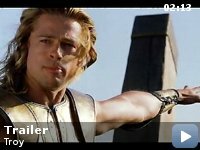 I have been a longtime critic of Brad Pitt as a second-tier talent who became famous only because of his looks, but in this film he surprised me. He is the TRUE star of the film. Achilles is easily the most interesting and entertaining character. I applaud Brad Pitt's effort in making his character a tragic hero. Achilles acknowledges that he is NOT the son of a goddess and is not immortal or invulnerable. The movie basically shows us how a rumor can blossom into a legend unto itself. Achilles' legend BECOMES immortal. He even refers to this in my favorite scene when he is inspiring his men and starts the invasion heavily outnumbered and still triumphs. Later in the same scene he scoffs at the so-called gods the Greeks and Trojans worship by decapitating the statue. I found this scene symbolic of the movie itself. The gods are nothing to both the characters and audience. Instead of supernatural powers and impossible feats we're treated to realism. Even Achilles' death is more realistic than in the myth. In the myth Paris does kill Achilles with an arrow, but because he has no battle skills his hand is actually guided by Apollo. If there was one thing I did not like in this film it was the transformation of Paris into some kind of hero. Paris was a coward in the original myth and I saw no reason to transform him into an overnight hero in the movie. 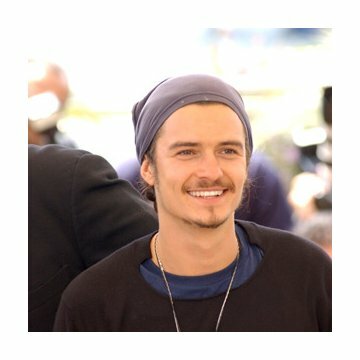 I guess Orlando Bloom fans wouldn't be able to bear seeing him as the bad guy and were given the uninspired transformation of Paris into a better archer than Robin Hood. While this movie was nowhere near the epic masterpiece that the producers had hoped or that it was advertised as, it did not deserve the bad publicity it received from critics. I applaud the makers of this film and look forward to buying it on DVD.